This is probably quite hard to believe, but every now and again I get offered a freebie; I receive an email talking about a restaurant that’s just about to open and I’m asked if I’d like to go along, on the house, and review it. They’re usually attractive offers, and they’re often places I’m interested in going to, but after some deliberation I’ve always said no. I did ask the question once on Twitter: could a review ever be truly reliable if you know the person writing it hasn’t paid for the meal? The replies I got were interesting, but nearly everyone was dubious – a few people said I’d trust you to be impartial, but I wouldn’t generally trust paid reviews, which is lovely, but most people remained unconvinced. How would you know you weren’t having a different experience to a paying customer because the staff knew they had to be on their best behaviour, they said? And even if you went anonymously, however hard you tried wouldn’t you slightly be pulling your punches because you’d got your food for free? All fair comments. A lot of people think that food bloggers set up their blogs mainly to get free food, especially in London where PRs are keen to generate as much buzz for their newly opened (or opened some time ago and dangerously close to falling off the radar) restaurants. This issue has reared its ugly head again recently after an incident where a London blogger, invited to review a bakery, was unimpressed with the level of freebies offered in return. She insisted on more macarons, the bakery told her to take a hike and then she spent her own money and threatened to give them a bad review (via Instagram, which is apparently where it’s all going on). Both sides took to the internet to fight their respective corners and Twitter went into spasm for about six hours, which is an eon in Twitter terms. Everybody weighed in, from bloggers (saying “that blogger has let the side down”) to restaurateurs (saying “bloody bloggers”). Even the Observer’s seasoned restaurant reviewer Jay Rayner weighed in, saying that it’s not enough to be impartial but you also need to be seen to be impartial. Well, I think he might be right. Anyway, this week’s review – and ER’s first sponsored post – is… Revolution! Only kidding. But Revolution did approach me several months ago inviting me to review them. Despite their reputation for droves of students downing vodka shots of an evening, they said they’d been growing their food offering for the last couple of years and they were keen to have a second opinion on it. I said no, nicely, but I made a mental note that I should head over there at some point. I also noticed that their menu had a surprising number of vegetarian options, another point in their favour. It’s a very long time since I went to Revolution, and I was surprised by how, well, tasteful the interior was. It’s been given the full retro-meets-shabby-chic-meets-industrial makeover and the dining room at the front is really quite pleasant – a big wide open space, all sturdy tables and copper lampshades with a banquette down one side and mismatched Chesterfields along the other. Going on a Monday, when it was largely empty, it was hard to imagine the nocturnal horrors that Revolution probably sees every Thursday, Friday and Saturday. I’d persuaded two people to come with me for once (I know! Gluttons for punishment!) so we grabbed an attractively tiled table for three and started flicking through the menu, dished up on a very à la mode clipboard. The menu was interesting – it had far more stuff on it than you would expect Revolution to be able to execute, but there were also touches which made you think “but what if they could..?” Little things here and there, from goats cheese bonbons to n’duja balls, from chorizo ketchup to chilli and fennel pork. 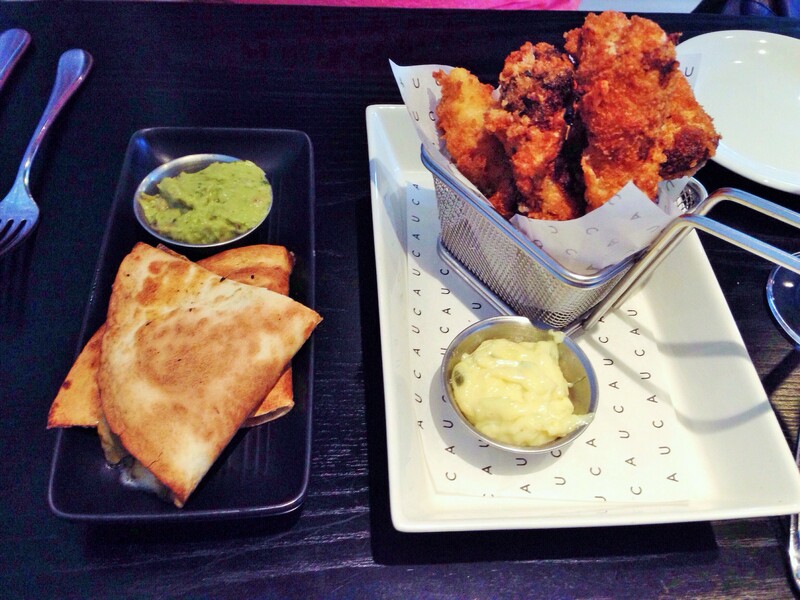 It still revolved around the ever-present small plates and the ubiquitous burger, but there was also pizza, burritos and – randomly – a chicken katsu curry. Revolution’s website has pictures of all of them and more (I only saw them later in the course of writing this up, but that might be just as well: some of them verge on the pornographic). 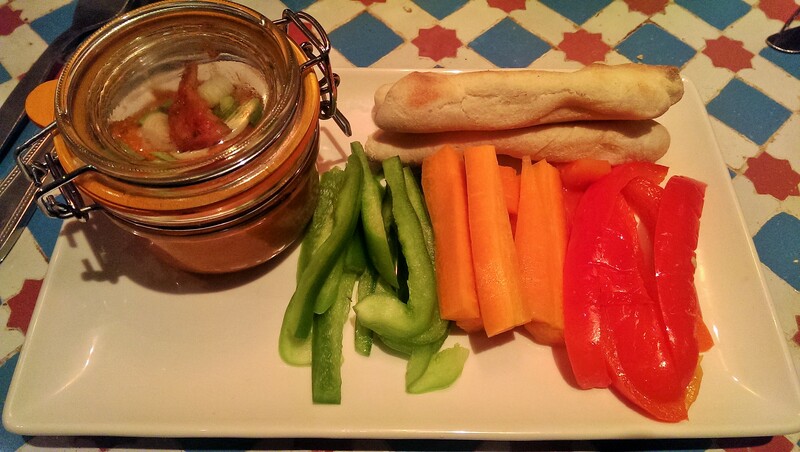 I was determined to order both a vegetarian starter and main at Revolution (just this once, not making any promises for the future) so the first thing I tried was oaky smoky houmous, which I imagine is a dish invented by Billy Ray Cyrus. It was nicely coarse, topped with sliced spring onion and a solitary sun dried tomato; I got more nuttiness than oaky smokiness, truth be told. It came with crudités and dough sticks. Carrot and green pepper were crisp, fresh and eminently suitable, the red pepper was a bit on the flaccid side. None of them came close to the dough sticks – little white fingers like the tiniest baguettes in the world. Of course they were the best bit: there was no vitamin C in them whatsoever. Overall it reminded me of my friend Jane: really lovely, means well, ever so slightly dull (don’t worry, it’s not her real name and she doesn’t read this anyway). 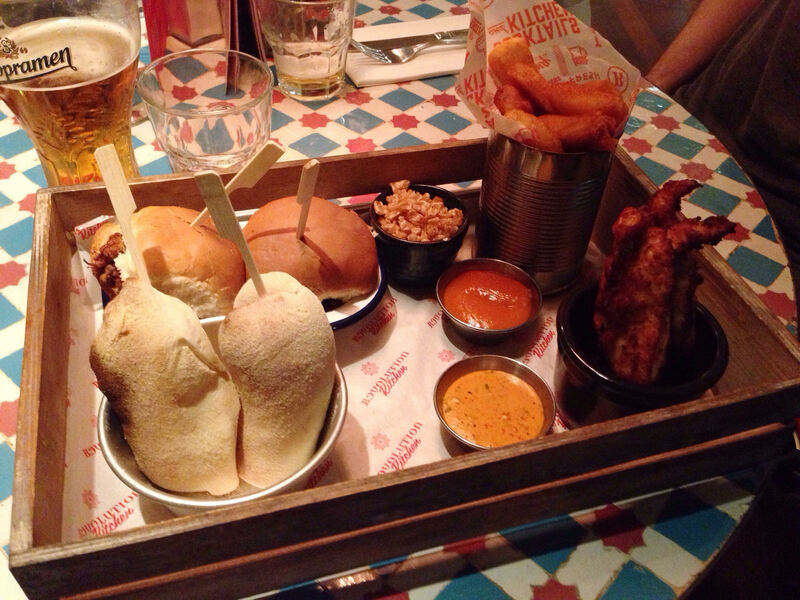 The other starter, shared between two, was the “street food crate”, a wooden, well, crate, filled with pots and tins of food, as is the fashion pretty much everywhere in Christendom right now. Having done that regulation piece of anti-hipster sneering (and rolled my eyes at the mention of street food somewhere that isn’t on the street) it’s only fair to go on and say that most of it was really quite nice. Pulled beef (another sneer) sliders (yet another sneer) were very tasty and well done with a little heat. The doughdogs – bockwurst snugly wrapped in a little pocket of something like pizza dough – were maybe a little closer to mystery meat than I generally like to get but they had a nice hint of smoke and I didn’t leave any. Buttermilk fried chicken had a thin coating and was a tad bland (and all four strips came fused together, which was a pity) but again it was enjoyable enough. “Viper dusted fat chips” were very good thick chips, irregular, crunchy and quite delicious. You also got “BBQ crackling puffs” which were little hot fragments of pork rind – pleasant but ever so slightly pointless, and two rather than the three advertised dips. One was the “big easy mayo”, which one liked and the other was a hot spicy number with a whiff of bourbon in it, which the other liked (a sort of Jack and Mrs Sprat of sauces). This all came to thirteen pounds and there were no complaints with that. Any feelings of deprivation suffered through eating vegetarian at Revolution vanished when my main course arrived. 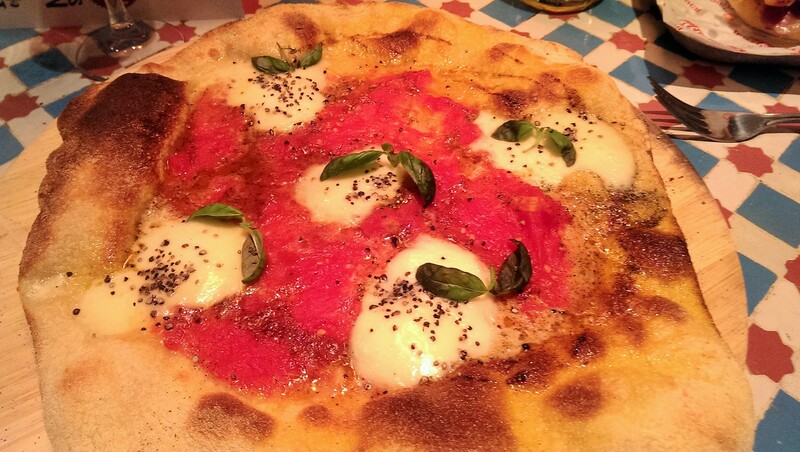 Margherita Napoli pizza, from Revolution’s summer specials menu, is billed as “a margherita pizza like you’ve never eaten before” and it actually lives up to that billing – in a good way. The pizza base was probably the best I’ve had in central Reading – crusty, chewy, reassuringly irregular and glistening with extra virgin olive oil. The tomatoes tasted fresh, not like the intense pureéd flavour of standard pizza toppings, and there was a generous amount of garlic in the sauce too. A dusting of coarsely ground black pepper made the whole thing sing. This is how good it was: not only could I have lived without the faffy micro basil shoots, I could even have foregone the mozzarella. Can you believe that? It made me feel that all the other stuff you can stick on a pizza is just window dressing, and as a devout non-vegetarian I’m rather surprised to be saying that. I just hope Revolution’s management doesn’t look outside the window and realise that summer is already over. Having fulfilled the vegetarian obligation, the other two orders were for burgers, and they were pleasant but didn’t match the starters or the pizza. The “Brooklyn chicken” came with more of that buttermilk fried chicken (and if I’d thought it through I would have ordered something different), a few pieces of it rather than the single breast I’d been expecting. The good quality streaky bacon was perfectly cooked at one end and a bit limp at the other. The smoked cheddar and fried pickles (the latter cooked in something like panko breadcrumbs I think) were lovely but the chipotle sauce had gone awol and the whole thing just didn’t quite work. The “Smokin’ Bacon” had the same problem, bacon going from floppy to perfect like some kind of gastronomic colour chart of how a rasher should be cooked. The burger was cooked through rather than pink, but despite that it was well seasoned and nicely tender and the smoked cheese worked much better in this burger than the Brooklyn chicken. There was apparently some of the previously mentioned chorizo ketchup (I still think it sounds like an absolutely magnificent idea) but the jury’s out on whether it was really noticeable or noteworthy. There were also some Wotsits in there – “I think it’s just for novelty value”, my companion said. Both burgers came with some skin-on chips, whose main purpose was to be Ed Miliband to the David of the fat chips that came with the starters, and some forgettable coleslaw (they probably referred to it as slaw but I point blank refuse to follow suit, and don’t start me on this “mac n’ cheese” nonsense). Service throughout was absolutely superb, especially considering that there was only one visible member of staff and he seemed to be working the whole room. 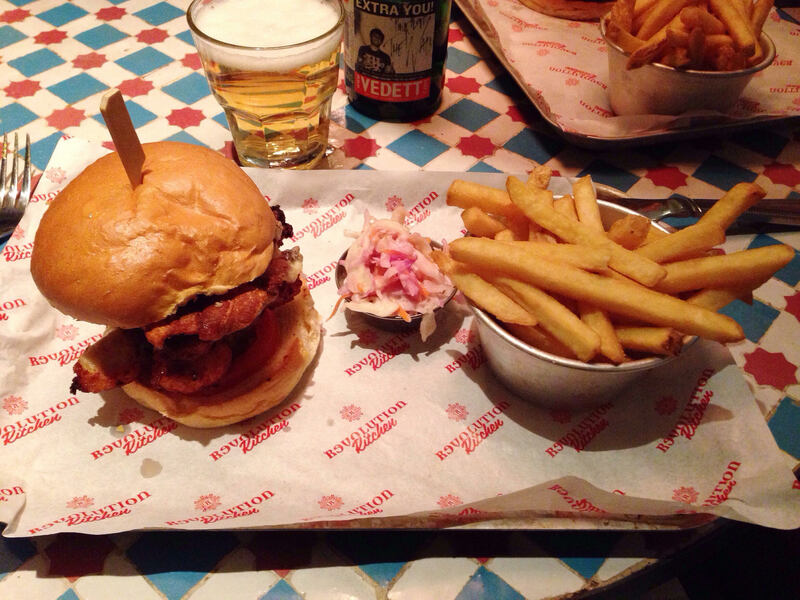 Despite that he was impossible to fault – personable, friendly, with opinions on the food (a particular fan of the Brooklyn Chicken burger, as it happens) and genuinely apologetic about some of the delays, even though we were in no hurry – perhaps most diners at Revolution are. In fact he was so apologetic that we did get a freebie after all; to make up for us having to wait for our mains he brought over a selection of six vodka shots. I think that would normally cost twelve pounds, and I can particularly recommend the fruit salad and peach flavoured ones (well, I wasn’t going to turn them away). Apart from the impromptu vodka we drank a mixture of beers (Vedette in bottles, Staropramen on draft) and a couple of glasses of a good, fruity Malbec. It seems odd to say so little about Revolution’s booze offering and to focus on the food: I wonder how many of their visitors do that? One thing I did have in common with most visitors to Revolution is that I passed on dessert – the delights of the “fluffwich” (I’ve read the menu and I still have no idea what it is) will have to wait. The total bill for three people, with two drinks each, came to fifty seven pounds not including tip. We went on a Monday when there are half-price offers on a lot of the main courses: without that it would have been seventy-two pounds. Revolution has been around such a long time that people probably don’t expect to eat there. I never thought I’d end up writing a review of it. But actually, if you judge it compared to its direct competitors, RYND and Oakford Social Club, I think it emerges from that pretty well. There’s a little more to the menu than the relentless tide of pulled pork and burgers. The room is much more welcoming. The service was far more impressive than I could have predicted (especially compared to the Oakford, where I always think they hire people for their ability to talk to each other and ignore customers). And the food? Well, some was really good – that pizza, again – and some was just decent. But for this kind of dining, at this price point, in this location that isn’t bad going at all. So I’m not going to rave about Revolution, because it isn’t that sort of place. I’m not going to urge you to go there at all costs. It’s not the hot new thing (and nor, for that matter, am I). But what I will say is that I liked my meal there, and I’d go again; I fancy trying their brunch menu, or having that pizza again for a weekend lunch. And now, you tell me – if you’d read this positive, constructive review and then, at the bottom, you’d seen that bit in italics saying I dined courtesy of Revolution, but all opinions expressed are my own: would you have believed me? Long before George Clooney and his tuxedo wafted into Berkshire the original famous George – Cole, of course – was ensconced in Stoke Row, enjoying his twilight years in a lovely almost-in-Berkshire village with its very own Michelin recommended pub, the Crooked Billet (itself famous for catering the first of Kate Winslet’s weddings). And you can keep your Clooneys and Winslets: I bet if you’d happened to bump into George Cole in the pub you’d have had a terrific evening. It seemed fitting to go to the Crooked Billet for the ER second anniversary review, as a mark of respect and all that, but it wasn’t to be. Even if I hadn’t got lost on the way (just once, I promise, but it could easily have been more) it still felt like too much of an expedition, too far off the beaten single-track with no passing places, not to mention the fact that it didn’t have any tables available when we arrived. Even restaurant reviewers sometimes don’t realise that they’ll need to book. On a Tuesday night. Miles away from civilisation. Deciding where to go instead involved much head-scratching, especially as the beautiful villages out that way are usually sited in areas of outstandingly poor mobile reception. Instead we drove to Henley (getting lost another time) and drifted through town wondering where we could eat before everywhere shut up shop for the night. So Villa Marina was the second choice this week, although it nicely echoes Pepe Sale (the first restaurant I ever reviewed), also an independent Italian restaurant with a touch of old school style. The restaurant was reasonably busy for a Tuesday night if not packed out, and it had the sort of warm prosperous glow that will draw you in after an hour of fruitless driving around the Chilterns (but I was hungry, so in truth a Wimpy might have had the same effect). The main dining room, an L shaped affair, was classically smart with crisp white tablecloths and cleverly done lighting: every table had a spot light on it, a nice touch which meant it managed the trick of being intimately lit but bright enough to see the food. The smartness extended to the clientele – all the men in the restaurant, without exception, were wearing collars. I can’t vouch for the redness of the trousers, but you wouldn’t have bet against it. 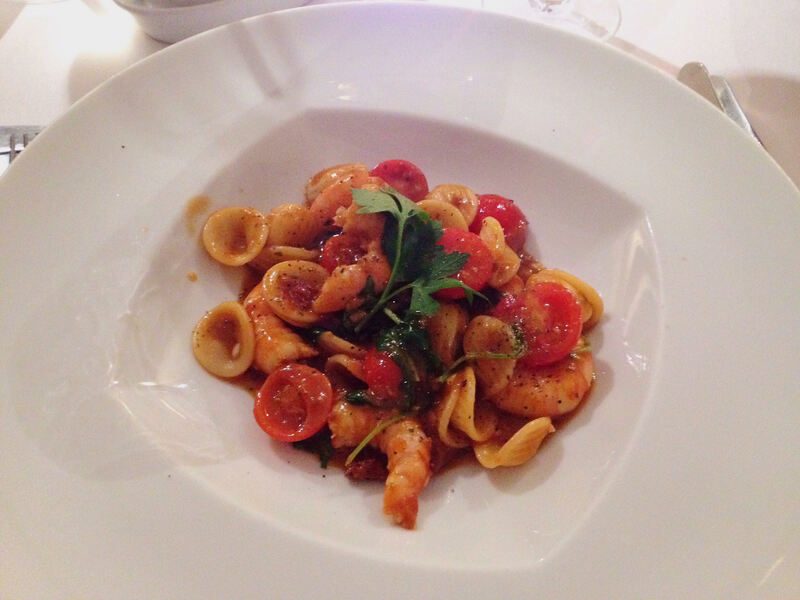 The menu was classic Italian with few surprises but quite a lot to tempt. I was impressed by its compactness: only a couple of pasta options (in their rightful place in the starters section and little or no encouragement to “go large” for a main) and no pizza. It’s didn’t look like a menu that was trying to be all things to all people, and that gave me confidence. We made our decisions – rather difficult ones, as it happened – while eating soft brown rolls spread with sundried tomato paste and salty, powerful tapenade. The first starter was one of the specials that night; avocado with prawns and crab. 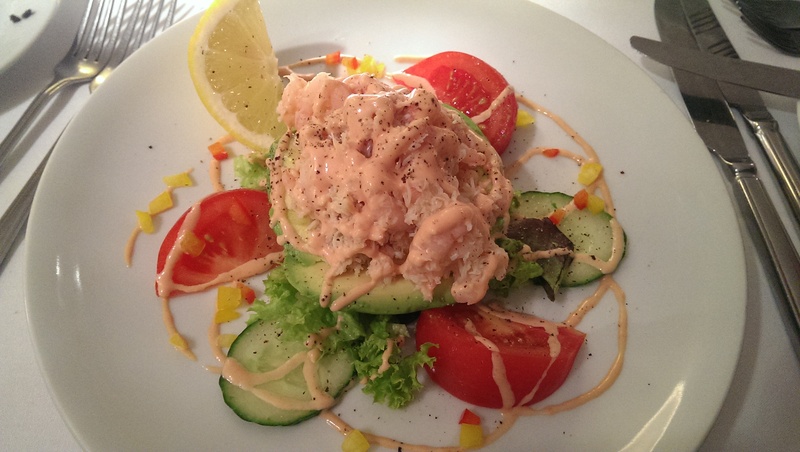 It was very generous – a whole avocado filled with plenty of prawns and crab in a pretty standard dressing a la Marie Rose. There were little signs of finesse here and there (someone had spent time cutting red and yellow peppers into very, very small dice) and the big wedges of tomato were surprisingly tasty which hinted at decent ingredients. And yet, even though I should have loved it, I just liked it. Perhaps the blame is mine: it’s the kind of dish I order frequently – Dolce Vita does a similar version with smoked salmon – so maybe I should have been more adventurous. Either way, it was nicely done but not exciting. The other dish was more successful, if also slightly restrained. Orechiette with prawns in a tomato sauce was quite a lovely little thing and, if anything, that overstates how much pasta was involved and understates how many prawns there were. The prawns were beauties, too – six big fat firm fresh specimens with just enough sweetness. The sauce was earthy and savoury, also with a touch of fish (perhaps there was some stock involved). Orechiette is one of my favourite pasta shapes, just right to trap sauce without being a faff to eat as conchiglie can be, and it worked perfectly. A little wilted rocket, some sweet cherry tomatoes and intense sundried tomatoes rounded things out nicely. I would have liked the pesto advertised on the menu, but mainly out of fear of missing out: I can’t say it would have improved it. The mains followed far more quickly than I’d have liked. 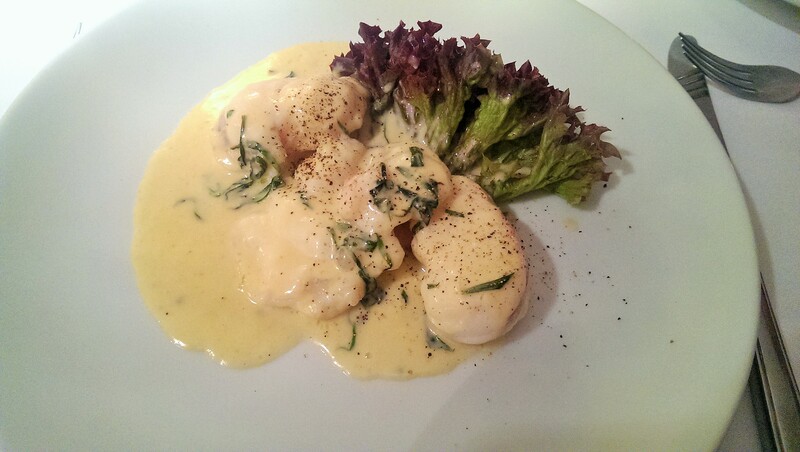 Monkfish with tarragon and brandy cream sauce was a delight: three decent sized pieces of monkfish in a deceptively light sauce with hints of tarragon (I always find tarragon a bit coconutty, although I suspect this is some form of culinary synaesthesia unique to me). This was under sixteen pounds, which I thought was pretty good value: most restaurants would charge more and/or serve a portion so small as to need a microscope (I still remember the weird little nuggets of cotton-wool I was served at River Spice: that was a monkfish waiting to be defrocked). 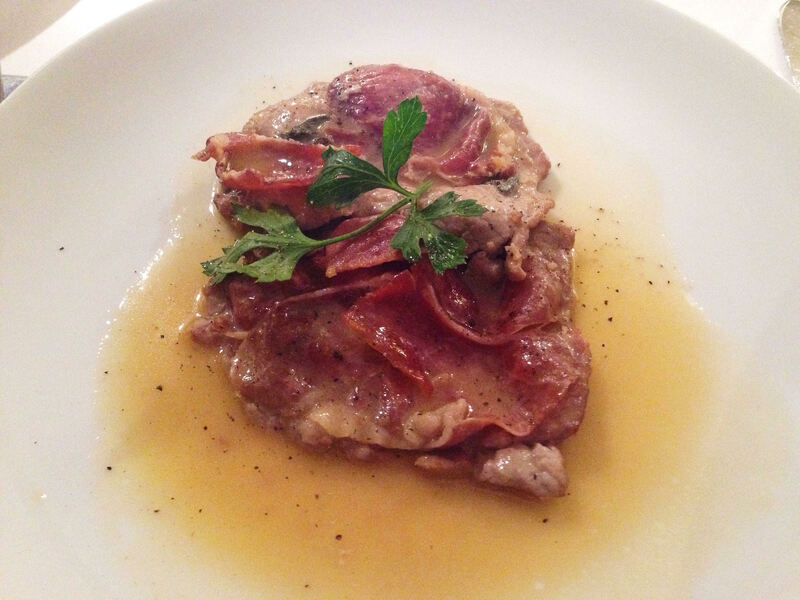 Saltimbocca was good but didn’t quite hit the heights – the veal itself was superb, delicate and tender and the parma ham was good quality stuff. But there just wasn’t enough sage which meant it didn’t have the earthy punch that it needed, and the sauce was a bit too light, thin and subtle. Like much of the food it was a little too well-behaved when what I really wanted were a few more sharp edges. I wonder which came first – the crisp décor and the well-dressed clientele or the impeccable, slightly safe food? You pay extra for vegetables. We got a bowl of sautéed potatoes (salty with a hint of rosemary) and another of steamed, buttered mange tout, carrots and sugar snap peas, along with two of the tiniest florets of broccoli I have ever seen. The menu says that they are three pounds fifty but neglects to mention that this is per person, and that felt a bit cheeky when you don’t have any choice but to order it (the single lettuce leaf that comes with the monkfish won’t count as vegetables in anyone’s book). Perhaps the mains weren’t quite as good value as I’d thought. That said, the extras were good – the potatoes were beautifully crisp (deep fried rather than done in a pan, I’d guess) and the vegetables, with just enough crunch and taste, were perfect with what sauce there was. But still, three pounds fifty per person stung a bit when the bill arrived. Three pounds was much better spent on the accompanying zucchini fritti we ordered, because these were fabulous – super light, wonderfully crispy, coated (I think) in a little semolina flour. An undignified fight broke out for the last few little scraps: I won. Another sign of how old-school Villa Marina was came when it was time to choose dessert. Nothing as modish as a menu here, instead the dessert trolley was wheeled round to our table and we got to review the selection. Dessert trollies also feel like a dying breed (I’m not sure any Reading restaurants have one, since Casa Roma closed) and I’m never sure how I feel about them. On the one hand, it’s nice to have a clear idea what your dessert will look like, on the other I quite like a hot pudding and a trolley pretty much rules that out. I was tempted by the tiramisu but went for the chocolate cake, essentially a layer of mousse on top of a sponge base. Again, it was a solid but unspectacular choice, sweet without being synthetic but certainly not overflowing with complexity or cocoa solids. If I went back I’d have the tiramisu, but it’s an if not a when and there are a few reasons for that. One is the service, which was very much Jekyll and Hyde. The waiters were friendly and suave, smiling and looking after their customers. Even the slips and mistakes were overflowing with charm in a rather crumpled, eminently forgivable way. But the waitresses seemed to have attended the Rosa Klebb Finishing School. The young lady who introduced the dessert trolley had a way of rattling off the list of options that was so abrupt and unsmiling that it reminded me of a prison camp guard. Similarly, there was an older lady who stalked through the room with an expression so dour that I was slightly scared to engage with her. If the men were old school, the women were borstal. Aside from the service, the other problem was the pace of everything – we’d finished three courses and been rushed out of the room in little over an hour, and that always puts me right off a place. Part of that I suppose is down to the dessert trolley and having your third course dished up right in front of you but even so, leisurely it wasn’t. The total bill, including a 12.5% “optional” service charge was eighty-five pounds. That was for two and a half courses and one glass of wine each (the recommended wines by the glass, a chianti and a chardonnay, were both nice enough to merit a mention but neither made me devastated that I couldn’t have more). The size of the bill was a nasty surprise: adding the service charge slightly ruined it for me because it made the total look worse than it was (and, left to my own devices, I highly doubt I would have tipped that much). Quite aside from the stealth charged vegetables the price of the special starter – nearly eleven quid – also made my eyes water, ever so slightly. Perhaps if the whole affair had taken a couple of hours I wouldn’t have minded so much, but I did keep thinking about other ways that I could have spent the same amount of money. Nobody wants to have that uppermost in their mind when leaving a restaurant. If you were opening a restaurant in Reading today, you wouldn’t open Villa Marina. That kind of high-end, slightly starched Italian restaurant, although not dying out per se, hasn’t been seen in Reading for a very long time (perhaps Topo Gigio, long closed on the top floor of King’s Walk, was the closest equivalent). I quite enjoyed my visit there, although it did feel partly like an evening out and partly the gastronomic equivalent of time travel. No shame in that, but it did make me value Reading’s restaurants just that little bit more, from the slightly naff marble tables at Pepe Sale to the no-frills room at Papa Gee, looking out onto the Caversham Road rather than the Thames. For that matter, it also made me appreciate how warm and reliable the service at Dolce Vita is, compared to the partially defrosted equivalent in Villa Marina. It all felt a bit Henley, and if there was a blog called Edible Henley I imagine they’d rave about this place. But we do things slightly differently in Reading, I’m very pleased to say. All of the new openings in Reading lately have felt very fashionable, very on-trend. From the sleek space of CAU to the white walls and industrial chic of Manhattan Coffee Club, from the street food – if you believe a word of it – of Wolf to the forthcoming lunchtime sushi of Itsu, it feels like Reading is starting to get restaurants and cafés which reflect how people like to eat at the moment (well, people in London anyway). All of these places have got plenty of exposure in the local websites, and there’s been a hubbub of excitement about them (and they keep coming – C.U.P. opens at the end of the month too, in a spot just along from Bill’s). But the place that’s most intrigued me lately isn’t any of the glossy town centre re-fits: it’s Bakery House, a Lebanese restaurant which has opened up the hill on London Street, where Nepalese restaurant Khukuri previously plied its (somewhat unremarkable, I’m afraid) trade for many, many years. It’s a funny place for a restaurant: all the action seems to be at the bottom of the street, where RISC and Great Expectations make for long-standing neighbours. After that it’s all barbers, language schools and a couple of fried chicken joints, presumably to offer sustenance to people about to enter or leave the Stygian pleasure palace that is the Legendary After Dark Club (another place for which the term use it or lose it feels extremely apt). But I kept getting good reports of Bakery House, and I became increasingly curious – if only to try somewhere new where neither the light bulbs nor the brickwork were exposed. And yes, there’s none of that palaver going on at Bakery House. The restaurant has the grill at the front and the dining room at the back, clearly with an eye on capturing some takeaway trade late at night (the menu offers a range of shawarmas and other sandwiches, easily portable and far more appealing than the dubious delights of Chicken Base at the bottom of the hill). The dining room, containing just ten tables, has tasteful battleship grey tiles and lightboxes on the walls with pictures in them which, surreally, appear to have little to do with the Lebanon. One is of a beach with palm trees, seemingly in the Caribbean. Another shows the windmills of Mykonos in the background and, err, a bowl of Greek salad in the foreground. A third is of a veritable explosion of tropical fruit. Despite that, it’s a nice space – and the mirrored wall at the back does a good job of bringing in light and the illusion of depth. 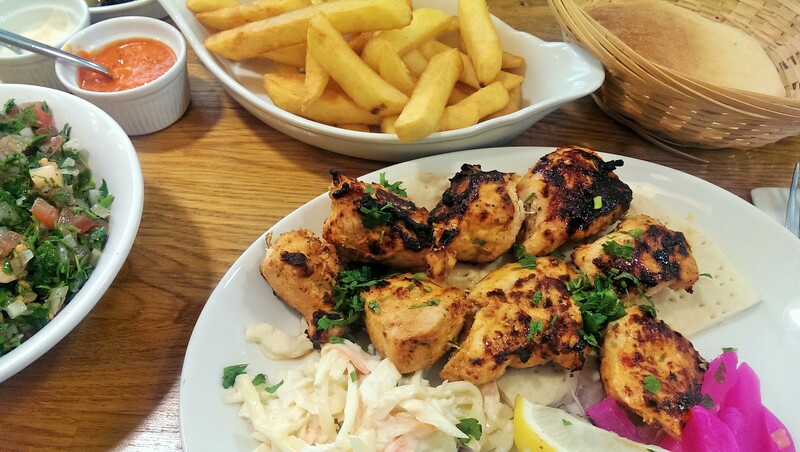 It’s a pleasing menu, too – a good range of hot and cold mezze, Lebanese pizzas, hot dishes straight off the charcoal grill or from the kitchen out the back. I was sceptical about the name Bakery House, but there is clearly baking going on – you can see the big oven, the pittas rising in the wooden racks on the back wall. They brought us some while we made up our minds and they were lovely fluffy circles, just right dipped in the intensely garlicky sauce or its slightly piquant chilli sibling. 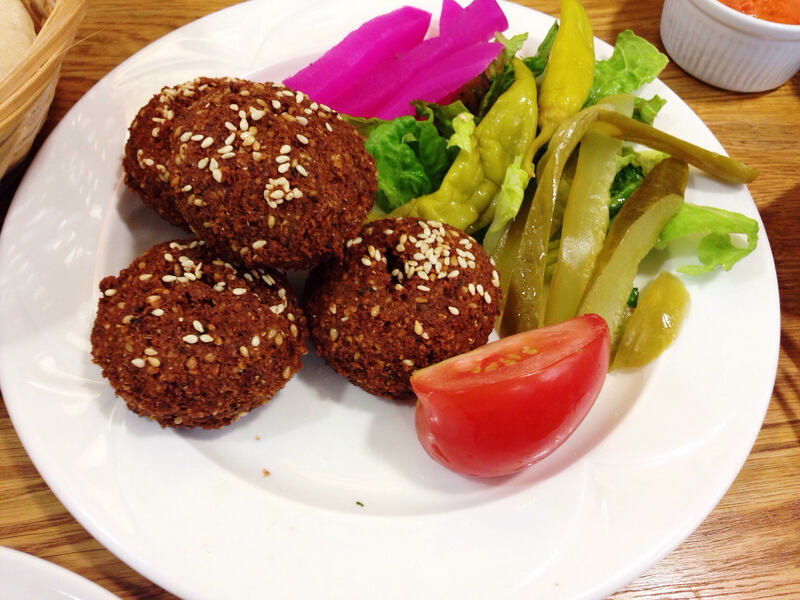 The falafel were probably the best I’ve had in this country and a minor miracle in themselves. You got four for three pounds fifty and the texture of them was spectacular – no stodge, just a deceptively light inside and an almost perfect thin, crunchy exterior. They made me angry at all the crimes against falafel committed by every supermarket’s sandwich aisle. Studded with sesame seeds, they were stunning dipped in the tahini sauce they came with, a silky, intense distillation of everything good about houmous with none of the accompanying clag. I also quite liked the salty, sharp pickled vegetables which came with them (purple, no less) but they were definitely a good thing you could have too much of. I wanted to try something from the bakery section too, and I was tempted by many of the small Lebanese pizzas. 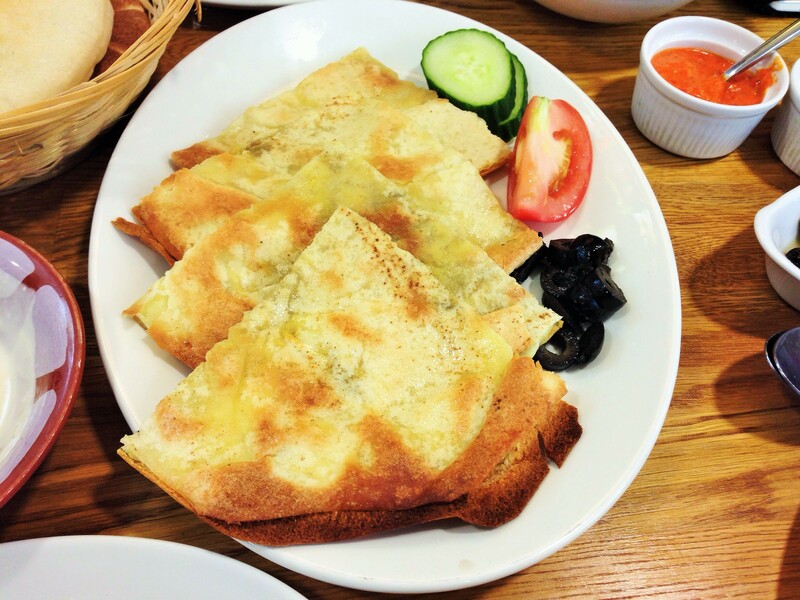 I ended up going for kallaj bil jiben and it too was a thing of wonder – a thin, translucent disc of Lebanese bread, the texture almost like a crepe, the inside smeared with spice and stuffed with halloumi, cut into quarters. Beautifully light, salty yet subtle, and stonking value at just over three pounds. When I’d arrived at about seven o’clock on a weekday night, the restaurant was already half full. By the time our mains courses arrived there wasn’t an empty table in there, with a steady stream of people turning up for takeway. I could well understand why, based on what I’d already eaten. The mains were equally keenly priced, with very few of them costing much more than ten pounds. 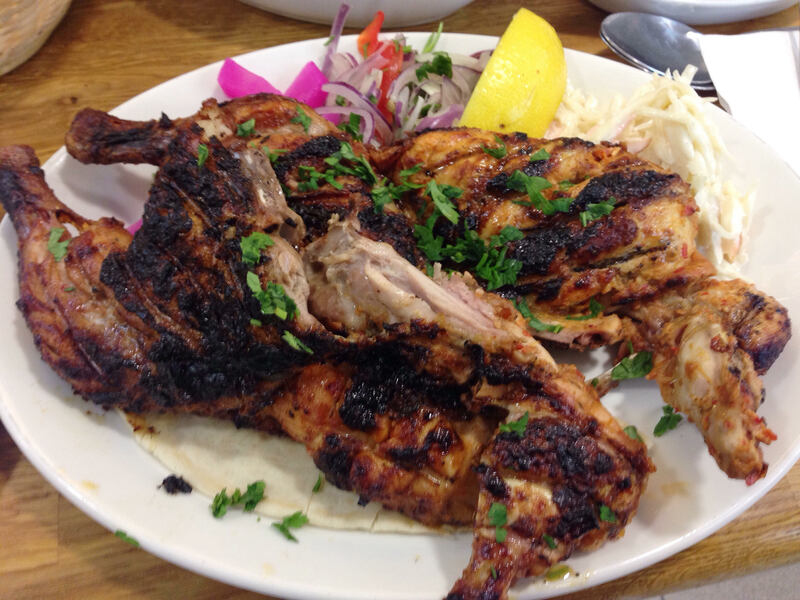 This is where I’d like to tell you how delicious the farouj massahab, the boneless chargrilled baby chicken is – sadly, I can’t, because they brought me the farrouj meshwi (the same thing, but with bones in) instead. I asked if there had been some mistake and almost immediately they offered to redo it or leave it with me and take it off the bill. No complaints, no grumbling, no making me feel like I was being awkward – just an apology and quick action. Figurative hats off. In the interests of eating at the same time as my companion, I went for the latter option and it was so delicious that I felt guilty about not paying for the dish. Granted, it was a faff – the plate was nowhere near big enough to strip the chicken off the part-jointed carcass tidily – but the chicken made up for that. Everything was how you’d want it: the skin moreish with crackle and char, the meat underneath tender and tasty. Every turn of a joint found an undiscovered shard of crispy skin or a beautiful seam of unmined chicken, and every turn brought another smile. The accompaniments I could have taken or left – the rice was an anonymous yellow basmati with what looked like bits of frozen vegetables, the coleslaw could have been from anywhere, those strange purple pickles again – but complaining about that would be like going to see Mission Impossible: Rogue Nation and criticising some of the extras in the crowd scenes. The chicken was the star, and I knew it. The other dish, shish taouk, was simple and effective: cubes of lightly spiced chicken cooked on a skewer with a pile of salad, coleslaw and yet more purple pickles. The outside of the meat was just charred and although the flavours weren’t as good as you’d find at La Courbe, Reading’s other Lebanese restaurant (where the chicken is all soft and fragranced with ginger) it was soon pepped up with the additional of some garlic sauce (so sweet! so dirty!). I’m pretty sure the chips were out of a bag but they were none the worse for that – and, as it happens, perfect dipped in the tahini sauce. The main let-down, really, was the tabbouleh. I had high hopes, especially after the starters, but it didn’t live up to the rest, with just too much pulpy tomato and not enough pizazz. Bakery House doesn’t have a licence, so the drinks options are a range of soft drinks and fresh juices. I tried the fresh apple juice and I loved it – the sweet, green, concentrated taste of apple without any of that sour sharpness of a supermarket carton. It was terrific, although I was struck by the irony that, at three pounds, it cost almost as much as either of the starters. Service was friendly and pleasant, although I felt they were still finding their feet and I got that impression from neighbouring tables too. I really liked my waitress’ disarming honesty – I asked her how to pronounce one of the dishes and she said “I don’t know, I’m from Romania” (I’d pick that over a bullshitter, any day). The whole bill for two starters, one main, a tabbouleh and a couple of soft drinks came to just over twenty-five pounds, not including service. When I tried to tip – because I felt bad about having such good chicken for free – the waitress tried to talk me out of it. When I left the owner told me I shouldn’t have tipped and gave me a little box of baklava (which, incidentally, were terrific the next day). How can you not at least slightly love a place like that? Bakery House is by no means perfect. The layout is a bit odd: most of the tables seat two but have a third chair, like a spare part, at right angles, so I think a table for three or four could feel a bit crowded (there are a couple of tables properly suited to four people though, tucked away in the corners). The service is charming but erratic, although they might just be struggling with being so busy so soon. The dining room was verging on the Baltic, which I think was a combination of some aggressive air conditioning and leaving the front door open to try to be more attractive to passing trade. Despite all that, it probably won’t surprise you that Bakery House is emphatically my kind of place. Perhaps I’m out of step with the rest of Reading, but I was much more comfortable in that unfussy, unpretentious room enjoying my food (and, I suspect, being in the company of fellow diners with exactly the same priorities) than I’ll ever be sitting at some faux reclaimed steel table eating “artisan produce” that has never been near an artisan because there’s no such thing as a bloody artisan any more. So I’m prepared to overlook the occasional misstep and I think I’ll rejoice in the fact that I, and Bakery House, are as far from cool as it’s possible to be (except for the overpowering air conditioning, of course). That said, I’m not sure whether Bakery House takes reservations and at this rate people will soon be queuing to get in: maybe being untrendy will turn out to be the new food trend after all. You heard it here first. CAU closed in July 2018 because its owners Gaucho Group went into administration. I’ve left the review up for posterity. I recently reached the stage where I was tempted to stop reviewing restaurants in the Oracle altogether. It’s never fitted with the ER ethos – full of chains like Bella Italia and Pizza Hut that are ten a penny all across the country. And it’s always felt pointless reviewing places like Wagamama and Yo! Sushi, because even though there’s a time and a place for them you probably already know what they’re like. The final straw was the closure of Tampopo and the announcement that TGI Friday would take its place (that’s when I began to wonder if the Oracle was actually run by Monty Burns). Still I guess they need the money, with plenty of shops consciously uncoupling from Brand Oracle and a fair few vacant lots, especially on the top floor. So, what changed (I mean, you’ve read the title, you know what this review is about)? Well, CAU’s an interesting kettle of fish for a number of reasons. It’s not a chain just like everywhere else, for one: there are only a dozen across the country. Also, I was fascinated to see how they’d done it, because the restaurant has been created out of thin air, in an empty and unloved space on the side of the Oracle, the fast but shallow Holybrook the only redeeming feature in a rather forgotten spot. But the other reason is that since it opened, CAU has been busy. Really busy. And all the feedback I’ve seen said it was pretty decent. Had the Oracle got it right for once? It’s an odd experience having dinner in a building which, a year ago, didn’t even exist. It’s a very neat use of a compact space, with two storeys and a modest terrace on the lower floor, prettied up with some landscaping and some kind of light installation on the opposite wall (I can see it would be a nice place to eat on a warm day). I sat on the top floor, in a long thin dining room with white corrugated iron walls and modernist lighting, all chrome spheres and swivel chairs. That compactness does show, though, in the space for diners: everything is just a little smaller than you’d want it to be (I wouldn’t have wanted to be a table for four in the banquette booths in the centre of the room – not with my elbows). As you probably know, CAU stands for Carne Argentina Unica (I wonder which came first, the name or the convenient acronym?) and is the younger/cheaper sibling of Gaucho, the awfully expensive steak house that is sprinkled over the spendy bits of London. So the menu is mainly Argentine, mainly beef, but not entirely – it does wander up to Mexico, across to Spain and even, for some of the vegetarian options, over to Italy. This presented a bit of a dilemma – I wanted to try a range of dishes, but ordering chicken or fish just to make a point about the diversity of the food felt like a silly act of tokenism. 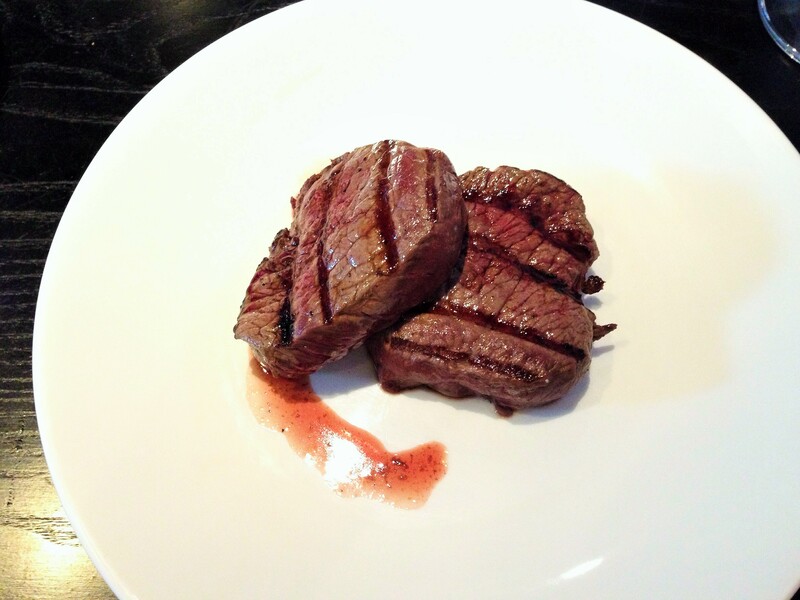 So if you don’t like steak this review might not be terribly enlightening – but anyway, there’s always the starters and the desserts. The starters were probably the most difficult decision of the evening. It really is an embarrassment of riches and you could easily have been reading about empanadas, Argentinian charcuterie or half a dozen other dishes. I was particularly torn between the swordfish carpaccio and the smoked haddock and manchego croquettes. When I asked the waitress for advice, she recommended the latter without a moment’s hesitation. That alone would have justified a tip: they were generous and delicious, half a dozen big, irregular, crunchy cylinders. Inside, the perfect contrast – a filling so smooth it was almost a béchamel, beautiful shreds of fish and tons of chives. The caper mayonnaise they came with almost felt an afterthought – creamy and bland where a bit of sharpness would have worked wonders – but it was by no means a deal breaker. I would have liked a bit more salt from the manchego but again, that was more twenty-twenty hindsight than anything else. They almost made up for the disappointment of the other starter, something that with hindsight I probably should have known better than to order. Quesadillas were a rather sad prospect compared to the crispy loveliness of the croquettes: the tortilla itself was pretty small and, despite the blurb on the menu, was by no means “packed” with vegetables or cheese. A layer of peppers, artichokes and courgette strips with manchego (for flavour, I’d guess) and mozzarella (for texture) was, in fact, even duller than it sounds. The guacamole on the side was pleasantly zesty but not enough to save the whole thing. It was bland and stingy, everything the other starter wasn’t. It’s my fault really – normally I’m good at spotting the duffer on a menu so I’m not sure what went wrong here. There are actually quite a lot of vegetarian options on the starter menu: I hope the rest aren’t as much of an afterthought as this felt. I should have had the charcuterie after all. The range of steaks on offer at CAU ranges from the mainstream – familiar cuts like rump and rib-eye – to the more high-end. This is where you can end up spending quite a lot of money, as you can at Gaucho: most of the speciality cuts start at the thirty pound mark and you get almost a pound of flesh for your pound of flesh. I struggled with spending that much on account of not being a Russian oligarch, so we went for the more conventional cuts on the left hand side of the menu, and it has to be said that these were a lot more keenly priced: two medallions of fillet was less than fifteen pounds, a sirloin was just shy of eighteen. Unfortunately, I had to wait slightly longer to try the steak than I was expecting. The medallions turned up perfectly medium rare as requested, but the sirloin was medium well with very little pinkness, no glorious blood seeping out onto the plate. This is, let’s face it, a pretty terrible gaffe from a restaurant which prides itself on brilliant beef cooked brilliantly. But sometimes, first impressions aren’t everything and the way CAU dealt with it was exemplary. I was in two minds about sending it back because, in my experience, that usually means that I have to watch everyone else eating their food (never fun) and then experience everyone else watching me eat mine (possibly even less fun). But the moment I suggested to my waitress that all was not well she sprang into action: both dishes were taken away, completely redone and brought to the table at exactly the same time. I’ve racked my brains and I can’t think of a single restaurant in Reading – even at the high end – that has ever gone that far, let alone without being prompted. Very nicely done indeed, and it totally won me over. So, once they finally arrived, they truly were perfect. The medallions were beautifully seasoned, perfectly grilled and the yielding texture when sliced was enough to render me speechless. I rarely have steak at home because I can never get it right, but eating it here made me feel like most of the places I order steak at can’t get it right either (and they certainly can’t for only fifteen pounds). The sirloin was just as good – the char and salt on the outside giving way to the softness underneath. At this point any reservations – about the location, about the loudness of the music, about the slightly irksome white swivel chairs – simply melted away. I’d have eaten this beef locked in a broom cupboard listening to the Vengaboys, if that’s what it would have taken to try it. The accompaniments were very much second fiddle, although that was only to be expected. Chunky chips, served in a little fryer basket, were coarse and crispy, fluffy inside and perfect dunked in the tiny pots of sauce (which cost extra, I should add). The sauces themselves were a little underwhelming, in truth: “garlic and herb aioli” was all herb and no garlic, all mouth and no trousers. I got parsley and just enough tarragon to make me wish béarnaise was on the menu. Still, I’m going through a phase of really enjoying chips dipped in mayo, so it wasn’t all bad. The chimichurri was better, but possibly had a little too much vinegar and not enough of everything else. I deliberately didn’t order a blue cheese sauce because it felt inauthentic; by the end I wished I hadn’t been so prissy. Just as CAU is all about beef it’s also all about Malbec – so much so that the wine list actually has four sections – sparkling, white, red and Malbec. I liked this, but what I really loved was that the vast majority of their wines are available in 500ml pots as well as full bottles. I really don’t understand why more restaurants don’t offer this, if only because I’m far more likely to order two carafes than I am to order two bottles. We had a Patagonian Malbec with our steaks and it was terrific – fruity but with a little smoke and not overwhelmed by the beef. Before that, while we made up our minds, we had an elderflower spritz – a very refreshing cocktail which tasted so little of alcohol that it was positively dangerous – and a very good Asturian cider. On to desserts: I’d seen churros arrive at another table so I’d already decided I had to try them. They arrived in a little Jenga stack, liberally dusted with sugar and cinnamon, with a little pot of dulce de leche (which I have a bit of a soft spot for). 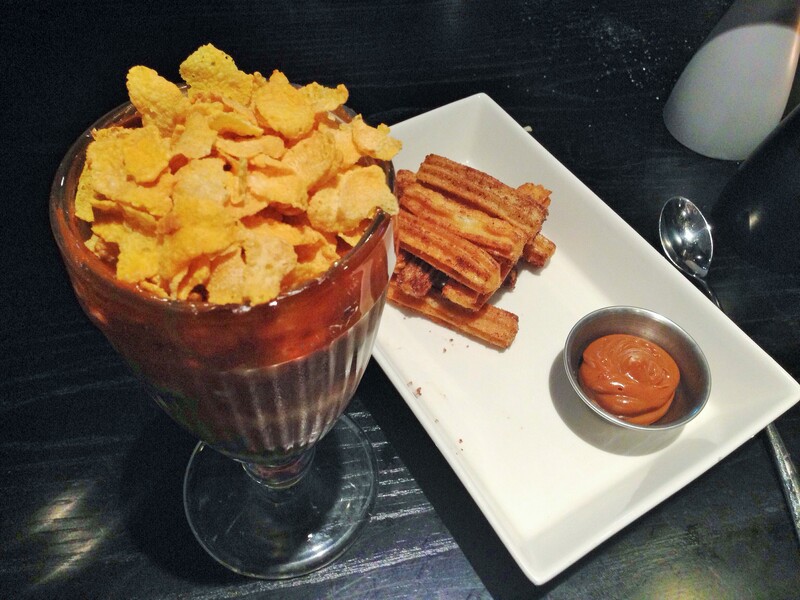 Sadly I have to say that they didn’t quite go together – the sauce was a bit too thick to coat the churros and the churros were strong enough to drown out the toffee flavour. I resorted to eating the two dishes on their own (not exactly a hardship), running my finger round the pot to get the last of the dulce de leche out Nigella-style. The other dessert, the cornflake ice cream sundae, is apparently a signature dish. I wasn’t a huge fan of it, I’m afraid. The cubes of chocolate brownie in it were crumbly delights, and the dulce de leche smeared round the inside of the sundae glass were gorgeous, but the cornflake-flavoured ice cream just felt like ice cream and the ginormous heap of cornflakes on top was impossible to eat without knocking them onto the table. I imagine it would be very popular with kids, but it wasn’t such a hit with me. Service made a bad first impression: the greeter at the front door failed to make eye contact, which was odd, but from that point onwards it was all terrific. Our waitress was bright, personable, knowledgeable and almost faultless – recommending dishes, correcting mistakes, talking about the restaurant and making conversation without going through the motions. But more than that, there seemed to be an energy about all the staff, from the chirpy chap who brought out our replacement steaks to the barman dancing along to the eclectic mix of music. I even found their “caugirl” and “cauboy” t-shirts amusing rather than naff – it felt like they were having fun but without any of that fake mateyness which is often so jarring in chain restaurants. The bill, including an optional 10% service charge, came to ninety-five pounds. That’s for three courses and an aperitif each and that pot of malbec. It’s funny, when the bill turned up the amount was simultaneously more than I was expecting (that fifteen pound steak had me fooled) and not as much as I thought the meal was worth. That rather sums up how I felt about CAU, in that I didn’t quite know what to make of it. Some of the dishes are really expensive, some are affordable. The affordable ones are terrific value. The food was bloody good, but first time round it wasn’t bloody enough. The staff make it feel like an informal restaurant but the prices at the high end are actually pretty close to what Gaucho would charge. And the clientele reflected that – some of my fellow diners were properly dolled up, to the extent where I felt a bit scruffy, and others were definitely there for a much more casual evening. You could look at all that and say that CAU is a restaurant that doesn’t know what it wants to be, or you could decide that it’s good at being all things to all people. Slightly against my preconceptions – I went expecting to like the food, hate the room and be underwhelmed by the service – I strongly suspect that it’s the latter. But I’ll probably go back soon, with my most carnivorous friends, just to be certain.